Abundant beauty with little effort. Hostas are so low maintenance that they actually require very little care. However, there are a few things that you can do each autumn to keep your hostas at their optimum health. If you are making your list of fall chores for the year, you may be wondering what to do - if anything - with your hostas. You'll be happy to learn that hostas require very little care in the fall. They are probably one of the lowest maintenance plants in your entire landscape. After fall's first hard frost, you should cut back the entire plant to the ground. Some gardeners have a difficult time cutting their plants back so drastically. Don't worry though; you will have beautiful plants again in the spring. Once the dead leaves are removed, they should not be composted. Destroy the dead hosta leaves to prevent the spread of disease. Another tip to avoid the spread of disease, such as Hosta Virus X, is to disinfect any tools you use to trim leaves and spent flower stalks from one plant to the next. Hosta Virus X shows up differently in each type of hosta. Most commonly you will see blue or green spots on light colored leaves. Leaf tissue looks lumpy and appears to have a different texture than the rest of the leaf. Occasionally you will find deformed leaves with brown spots as well. Darker hostas will have a bleached appearance. 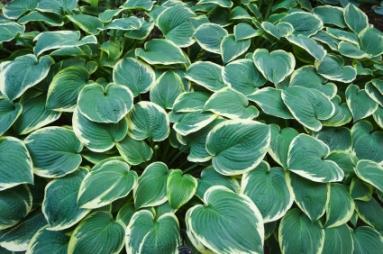 Some hostas will show no symptoms at all until long after being infected. For more information about Hosta Virus X, read the news release from Iowa State University. The foliage on your hostas will die back in the fall, so you typically won't need to begin slug control methods until spring. There are several ways to cut down on the slug population around your hostas, including the following methods. Remove the dead foliage to keep your hostas healthy. 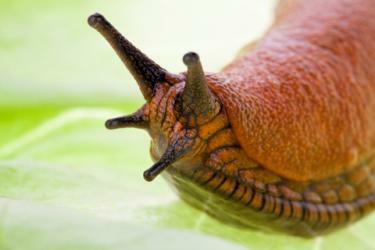 Slugs love to make their home in the dead foliage so removing it as it occurs goes a long way toward discouraging them. Diatomaceous earth is also an excellent slug barrier when sprinkled around your hosta plants. Place shallow dishes of beer around your garden in areas that slugs tend to frequent. Slugs are attracted to the beer but they cannot get out again and drown. You can use commercial slug bait, but it is not the best way to get rid of slugs because you can accidentally poison pets and other animals with it. Mulching is always a great way to conserve water and insulate roots from extreme temperatures. Weeds are also kept at a minimum when you use mulch in your garden. If you choose to mulch your hostas, be sure to keep mulch away from the stem of the plant. Mulch lightly, only using an inch or two, to discourage pests from making a winter home. Some gardeners mulch over the entire plant once it has been cut back. This can be helpful in areas that have warm days and cold nights because it keeps the soil at a consistent temperature. When the ground continually freezes and thaws in the fall, the hosta roots tend to work their way out of the ground. 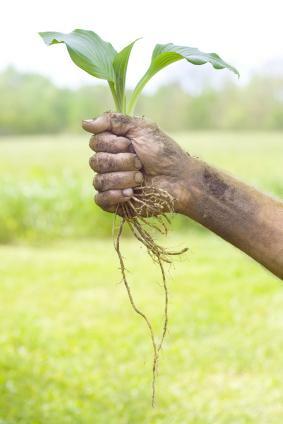 Exposed roots are unhealthy for hostas because they can dry out or even freeze in the winter. If you decide to mulch over your hosta plants, use pine needles to prevent slugs and other pests from taking up residence there. Just as fall is a great time to divide and plant many of your favorite plants, hostas can be divided in the fall before the first frost. Be sure to do it early enough so that newly planted hostas have time to establish themselves before the ground freezes. Dig up the hosta plant and cut it into divisions with a sharp knife. Be sure each section has a crown and roots, and don't forget to disinfect the knife before moving on to the next plant. Plant your divisions in a hole that is twice as deep as the as the root section. Add any soil amendments you may need, such as compost, and then mound the soil in the middle of the hole. the hosta roots will grow down over the mound while the crown stays at soil level. After replanting your divided hostas, water them well. Fall care for hosta plants does not include fertilizing, unlike many of your other landscape plants that benefit from the extra nourishment for their roots as they prepare to go dormant in the winter. Hostas do need fertilizer; however this chore is most effective in the spring when they need a balanced (10-10-10) fertilizer for that extra boost. Fall care for hosta plants is very simple. With very little effort, you will be rewarded with beautiful plants to enhance your landscape when spring returns.